Through setting up a film shoot on stage, and moving through the process of capturing footage in a similar way to the recording process in film and television, the work confronts the problem of representation and reproduction in both screen based media and in theatre. In the studio this theoretical starting point began to spear off into a deeper concern with the problem of recapturing, not only of the choreographic score itself, but the same performance; the same inflection, presence, or emphasis each time. The fragility of the live act, and the performer’s role in finding a way to make the “reiteration of the vanishing moment” believable, became the central creative investigation. Is each reiteration only ever an approximation of a previous iteration? Can a performer ever feel the same physical or psychic sensations found in a previous performance? And is this desirable anyhow? I began to think about this disparity and its relationship to contemporary life, where the line between what is truly ‘live’, ‘real’, or manipulated is blurred. Is there a difference between ourselves as subjects inside of reality television, computer screens, You Tube clips, Facebook photographs, and our ‘real’ selves? Am I ‘performing’ my profile, or my true authentic self? How ‘real’ is a person on ‘reality’ TV? While researching ‘The Recording’, the point was brought home for me on watching the TV series The Sopranos. One of the characters, Carmela Soprano, is trying to get her husband Tony’s attention while he watches a small TV set. He replies: “Just a sec, so much more interesting”. She asks: “Than what?” He says: “Life”. She replies: “What, are you kidding me? It is your life”.3 So what is more real? Are mediatised representations more interesting? Is the present and live more desirable, or the recaptured, reproduced and manipulated, and as Carmela Soprano suggests, no longer any different? ‘The Recording’ plays with the slippage between the real and the mediatised. By using a movement vocabulary literally drawn from film and television, a strategy to present embodied movement we instinctually recognise and feel comfortable watching, ‘The Recording’ overthrows what appears at first glance. Cinematic lighting, camera framing, and emotional dramatic sound are layered over movement sequences to create a familiar tone and empathy, drawing the viewer into the work, before they are deconstructed, disrupting and breaking apart the world on stage. Through layering aural, textual and visual elements, a rehearsal, (which perhaps is the most authentic performance possible with its slippages, mistakes and rough edges? ), is transformed to the dramatic and back again, uncovering the way in which a live moment can be manipulated, recorded and reproduced. Exposing the risk of manipulation and blind acceptance, the gap between the live ‘rehearsal’ and the capturing and recapturing process is opened up and tested on stage before the audience. By this, I take Noë to mean that in theatre, an authentic, truthful exchange between the presence of the performer and the audience is marred by theatrical conventions. However, Noë points out that there is an exception, the symbolic space of the theatre is held up by the pretense that the “possibility of something going wrong on stage is always a live one; as audience, we only pretend that we are not alert to it”.5 This denial, and our susceptibility to embarrassment when something does go wrong, according to Noë, “is evidence of modernity’s only fragile hold on us”.6 While we surrender and enter the world of theatrical fantasy, the suspension is tenuous, on a precipice. Liveness affords alternate possibilities – something else could happen. 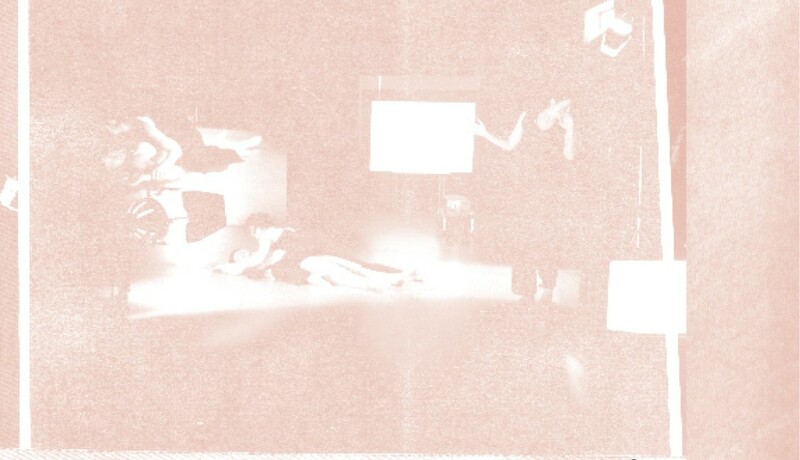 By playing with the line between reality and fantasy, ‘The Recording’ aims to disrupt the symbolic flow of the theatre and show how both audience and performer are susceptible to slippage beyond the pretense of the stage space. The work invites the ‘something else’ to happen. Although already rehearsed, seemingly so well known, yet elusive in its perpetual disappearance, in ‘The Recording’ the performer measures their success in ‘recapturing’ or reiterating the live moment, making it ‘real’, new, and believable each time, while in a similar way to the audience, denies the potential of something going wrong. While we surrender and enter the world of theatrical fantasy, the suspension is tenuous, on a precipice. Liveness affords alternate possibilities – something else could happen. Like watching actors or dancers in an open rehearsal without dramatic lighting and sound to mask or emotionally manipulate the audience’s perception, in ‘The Recording’ the audience can see more than they should – the performer’s real effort to ‘get it right’. The impossibility of recapturing, the search for the definitive version, and making the performer’s work to achieve the live moment over and again obvious and apparent, ‘The Recording’ makes the case that the theatrical struggle for presence, and for transcendence and mastery is in fact a real one. Every collective body has a ‘technology of belonging’ and all partaking individuals are subjugated to its transformative powers that function not unlike a social membership fee. As such, social bodies are a stage and we are made to do their dance.